This is a note about small to medium-sized flat items. 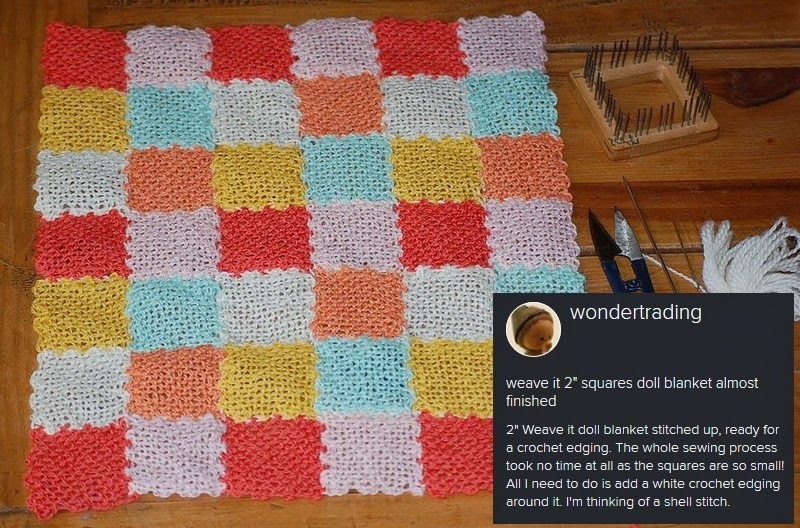 I love making pin loom blankets-- but they take a really long time to weave. Sometimes it feels good to make something that offers a more immediate payoff. My favorite bigger-than-a mug-rug items are pillow tops and doll blankets. Both aim at moderate size, 12" square to 18" square. Both can be completed pretty quickly, which means that you can move from conception to gift giving in a week or so. I made example to the right to accompany the Amish Style doll. Below it is another, even better example of a doll blanket made by wondertrading using 2" x 2" squares, made on a 2" Weave-It. 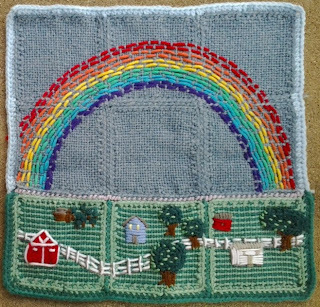 Anything that we call a doll blanket can just as easily be used as a pillow top, a wall hanging or an inset in a larger blanket. The following two items were specifically made as pillow tops although it is more likely that they will end up as mounted hangings. By "mounted" I mean that my plan is to buy a couple 12" x 12" canvases and mount them using a spray-on fabric adhesive and staples around the edge. 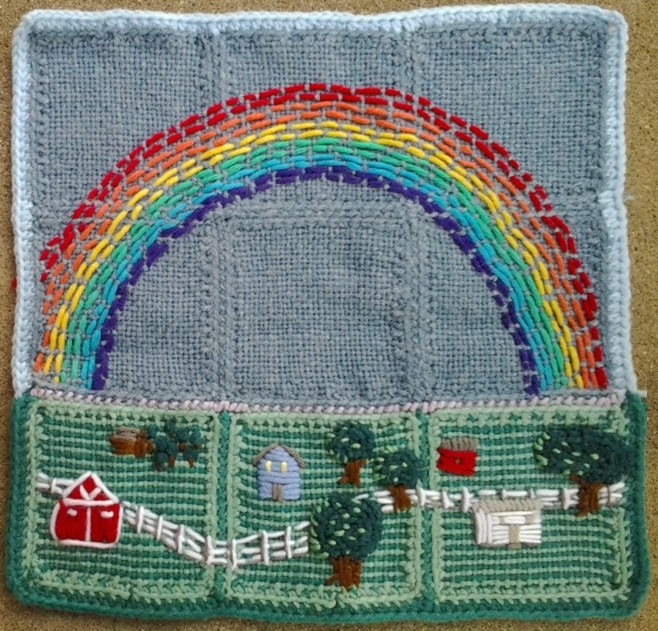 On the other hand, I am fascinated by the idea of completing a series of woven pictures that displays several seasons. These two pillow tops were intended to show approximately the same image as it would change through summer and winter. It would be easy to do the same through summer, winter, spring and fall. 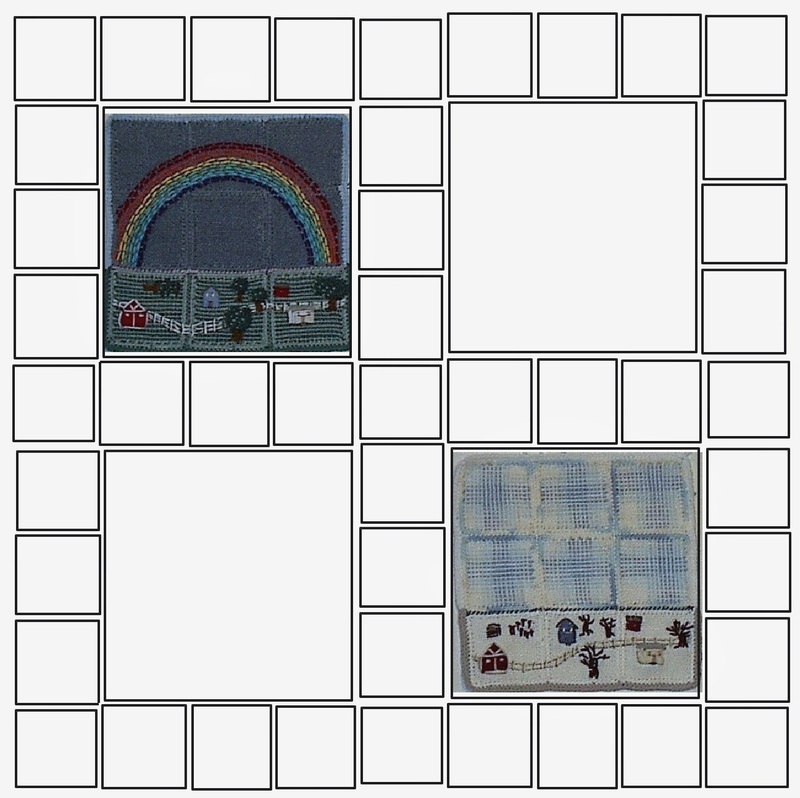 Because all of the squares are 4"x4", these would be a great project for a Zoom Loom or other 4" pin loom. Here is some construction information on the pillow tops. 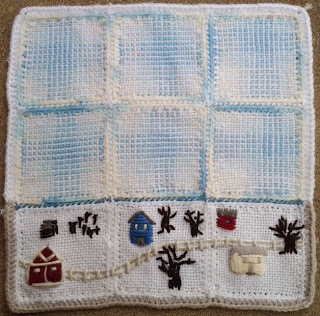 I used a single crochet edging around each of the squares and joined them with a whipstitch. I edged each pillow top with half-double crochet. If I were to do them again I would edge them with single crochet. The embellishment is free-hand, except for the crowns of the trees in the Summer pillow top, those are little crocheted circles with some tiny stitches in a lighter green on top. 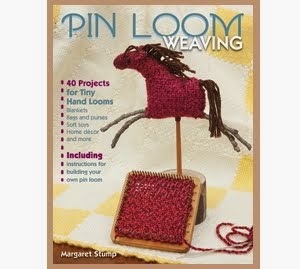 One feature of pin loom use is that you can wind on a variety of colors to achieve different effects. I made the green stripes on the Summer pillow top by winding on two layers of dark green yarn, then winding one layer of light green yarn and weaving in the same light green. The winter sky is made with the same striping technique, except the first yarn was a variegated blue/white and the second was white. I also worked pretty hard, selecting and sniping sections of yarn, to make sure that the designs were somewhat centered. 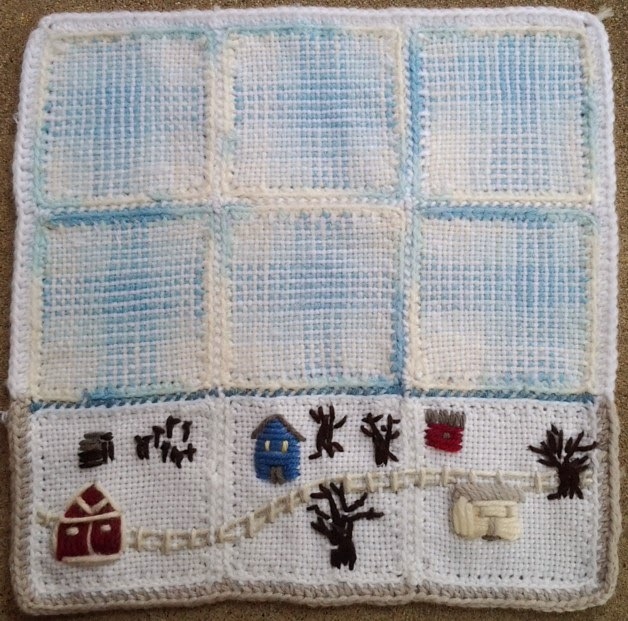 Four Seasons Medallion Throw, draft--not to scale. 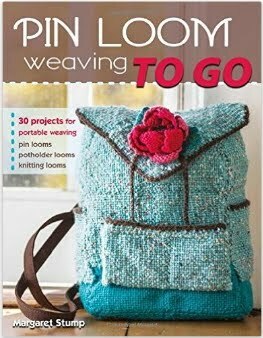 I love the way that pin loom projects fit together so well. 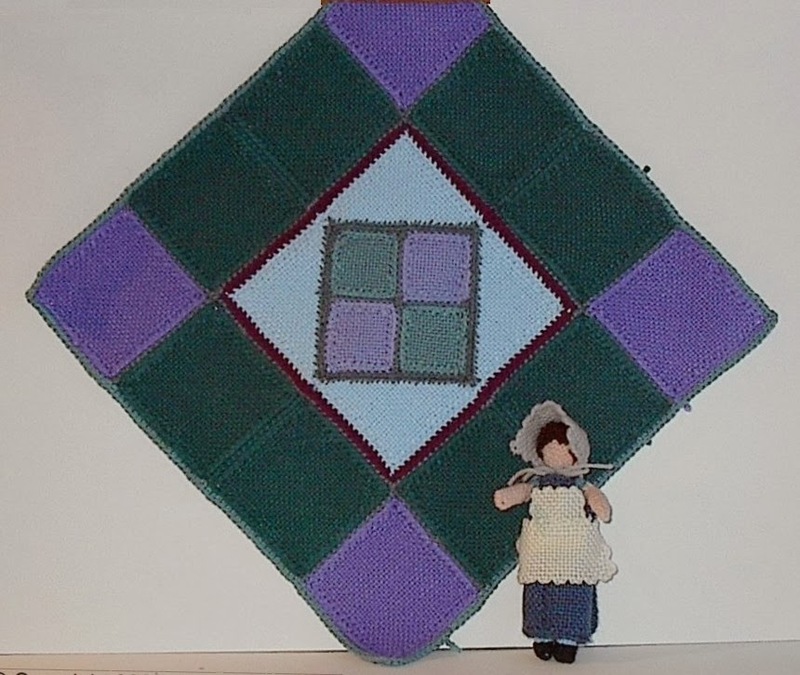 Each completed pattern is a 12" square. 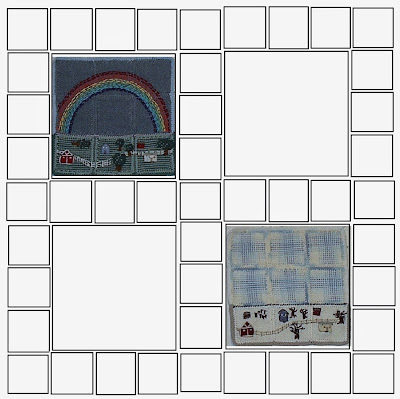 I could see these two 12" pieces, along with two more representing spring and fall, serving as medallions, surrounded by an edging of 4" x 4" squares other borders and turning into a great little blanket or throw. Well now I'm excited about them again. It may be a while before I can pick up on this project, but I'm going to do it someday. I think it could have a nice retro "Currier and Ives" feel to it. It would make a great present for someone that you cared a great deal for -- because there is a lot of weaving and work in it. However, this is also a great example of a group project, one that can be shared out with siblings and cousins, so that it not only represents the quality of seasons, but also the quality of family.